Everyone seems to be talking about lead magnets and sales funnels. It’s supposed to be the next best thing since sliced bread. If you are in business, you need leads that convert to sales, or you have no business. It’s pretty simple to just say that, but the actual process can be incredibly time consuming, but it’s critical to your business growth. So what exactly is a lead magnet? A lead magnet is basically a piece of content that motivates a site visitor to give you their contact info – name, email address and sometimes, even their phone number. It is a tool that you can use for list building. Your lead magnet should target your prospect’s key issues or questions in order to get them to fork over their details. Let’s face it, no one wants to be on yet another newsletter list that doesn’t provide them with any value. I just “unsubscribed” from almost 80 different newsletter lists because all those messages were just cluttering up my email box and actually were distracting me from getting my real work done. They all promised me the sun, moon and the stars, but at the end of the day were a waste of time. Keep that in mind when you are sending out a weekly newsletter to your list. You can’t just make offers to create income for yourself. You need to add real value. Share tools and resources, don’t just try and sell them all the time. Getting back to your lead magnet – it is the first step in your sales funnel process. It addresses a core issue for your prospective client. 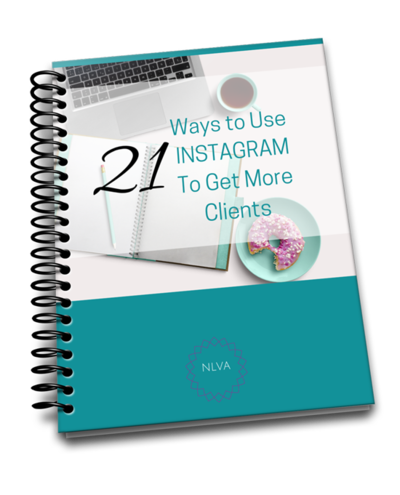 On my site’s home page, on every page and every footer, there is an offer to opt-in for my FREE report, “21 Ways to Get More Instagram Followers“. Instagram has gained tremendous popularity and is becoming a lead source for traffic. My thinking was bloggers and coaches, who are in my core audience of clients, would find this interesting. Interesting enough to actually provide me with their name and email address to receive it. Some ideas for lead magnets you could create and use on your website are ebooks, a cheat sheet, a checklist, or even a workbook. Pulling together something professional looking can take a bit of effort, but it is well worth growing your audience and list. Who are you going to market your products and services to without a list? If this isn’t something that makes you excited to get started, you might consider delegating that task (hint, hint). Delivery and automation is something we will talk about later, but know that once they “opt-in”, there had better be an email sequence in place that will automatically thank them and send them either a PDF or a download link to get immediate access. No one wants to wait until you access your email to send them a file. Setting up your opt-in, or lead magnet is something a virtual assistant can definitely help with. If you find this is a task that you are still putting off, maybe we should talk. My lead magnet package allows enough time to set-up one complete opt-in from start to finish. This does mean you need to have you lead magnet completed written. I can help you to format it (make it pretty) with your website colors and branding, and set up that automated sequence via your autoresponder. I use MailChimp, but am familiar with just about every autoresponder out there, including AWeber and Constant Contact. I love MailChimp because it’s easy to use, and the upgrade from free to accessing the automation features is only $10. I have not used Infusionsoft, but I do know a few people I could refer you to if that is what you are using. So to recap, if you don’t currently have a lead magnet, or opt-in on your website – you really need to consider what you are potentially losing in new potential clients, purchasers and revenue. A small investment can take the whole process off your hands and let you focus on what you are really great at. You can take a peek at my Work With Me page, to see if you think we could be a good fit, or just click on my Business Solutions page so we can get started. Either way, we chat first, then I invoice you for whichever package you are interested in. It’s up to you. My follow-up posts will talk more in-depth about sales funnels in the coming weeks, as I am gearing up for a whole new service launching in February. Be sure to opt-in to my list to get details and receive a special “subscriber only” offer. It’s 2017. Let’s get you set-up with the business of your dreams, making more money with less stress.